When not at work,you can usually find me out west visiting in the land of our Wild Horses. It seems that there is always something new to see or a new adventure to be had. 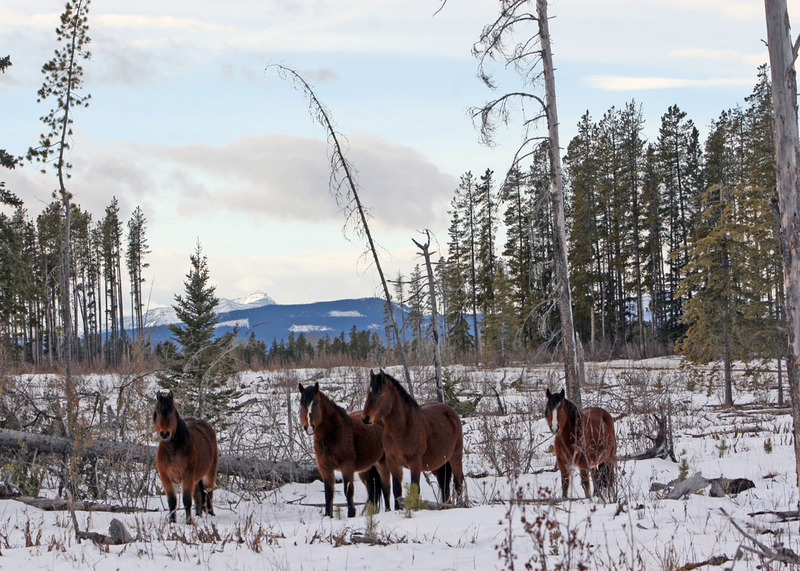 As I had mentioned in a previous post, I thought it would be adventurous to visit the wild horses in the muskeg meadows, by cross country skiing. I must admit that so far this is not going that well. 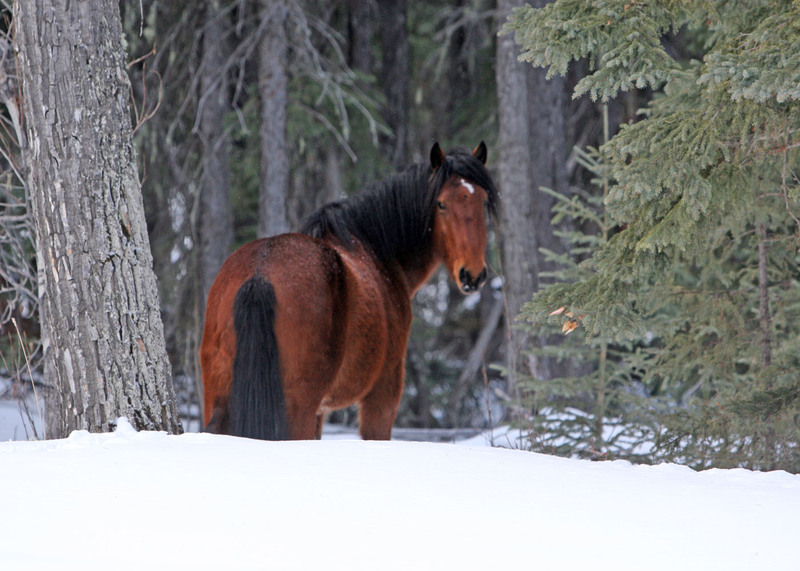 Although we did manage about five miles through heavy crust snow with no tracks to follow, the only horses we saw were at a distance and on the move. There could be some other reasons for this, but most of it was probably because of my loud moans and groans as I tried to get on my feet, time after time. I would of made a gymnast proud with some of my body positions just before hitting the snow again and again. I did make it back to the vehicle though and at that point it was enough skiing and it was time to go looking for horses in a more comfortable mode of travel. PS. I have gone out again and the sking is getting better and my falls are not as frequent. Joint pain medicine does really work!! On one drive on a sunny afternoon we headed toward the Ya Ha Tinda. I wanted some photographs of elk and other wildlife and of course those of the wild horses. We checked a few back roads and came across a few small herds of wild horses and a couple of young bachelors that were together. Then while heading toward the ranch we came across one herd in the Big Burn Flats. While I was taking photographs of the herd, I noticed that the lead mare, a beautiful red roan, was extremely nervous and anxious to move out of the flats. That is when I saw the reason, for with her was a young foal only a couple of weeks old at the most. A beautiful gruella filly with a dark muzzle. This astounded me as I looked at this beautiful young creature. 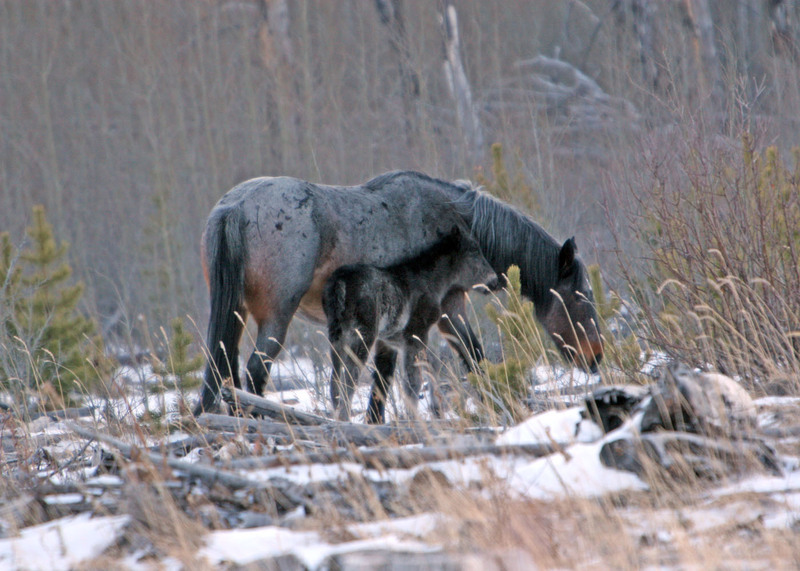 Very seldom would you ever find a wild horse mare with a foal this early in the year and if it does happen the foal rarely makes it. The mare was in excellent shape and as it ran along side it’s mom, we could tell that the little foal was also in very good shape considering the time of year. The stallion made sure they were safe, as he came bursting to the front blowing his warning and putting himself between the intruders and his new off spring. The courage of the wild horse stallions, who are willing to sacrifice themselves, to protect their herd, still thrills my heart. Feeding on moms warm milk, will hopefully keep this young foal going. 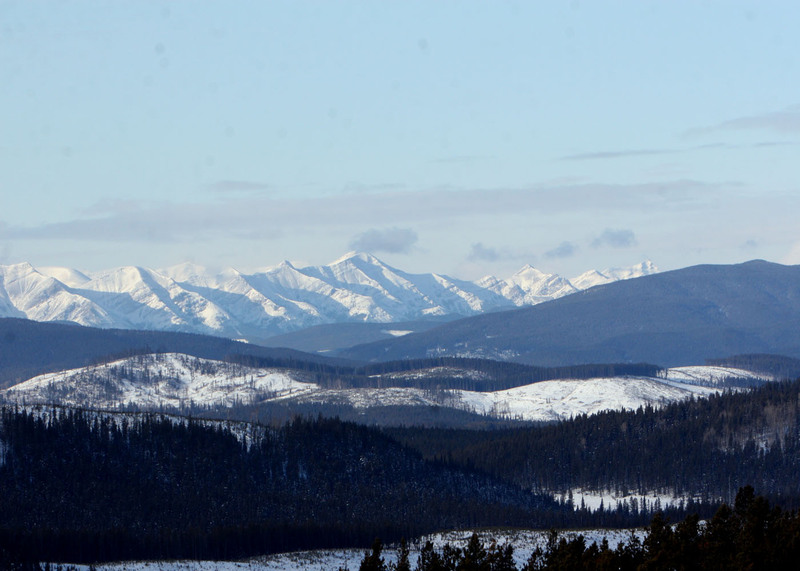 The area they inhabit is pretty wind blowing and the hills bare quickly of snow cover. That will allow the mare to stay strong and produce milk for the baby. I will continue to check as often as I can for it’s well being during the rest of the winter. After taking numerous photo’s we moved on to let the herd relax from our presence. That is when a highway robbery took place. 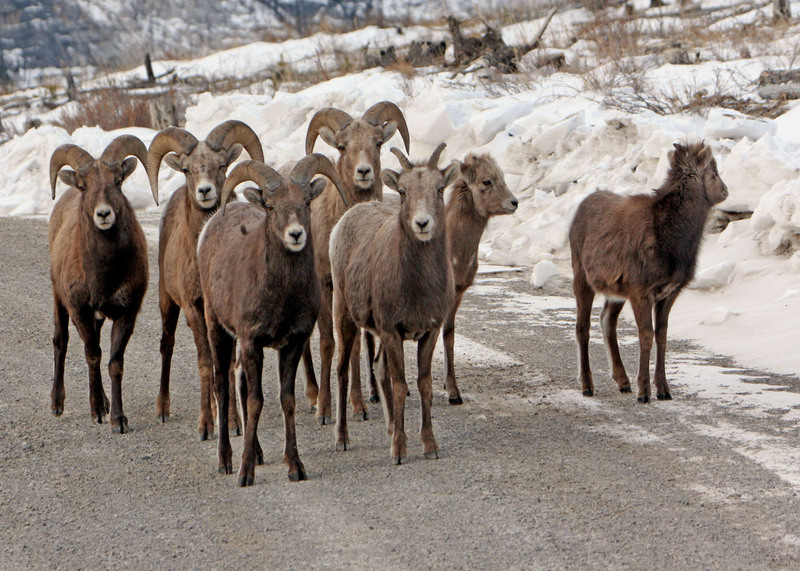 As I proceeded slowly up the road, always looking to the sides of the vehicle for animals to photograph, we were suddenly confronted by a small band of bighorn sheep. Lead by a ewe, they stood in the middle of the road daring me to come closer. The ewe was licking her lips and stood trying to stare me down. I wilted under the pressure of this bandit’s intense look. I stopped the vehicle in wonder at this beautiful site and began to take pictures. That is when the whole herd came right up to the vehicle. 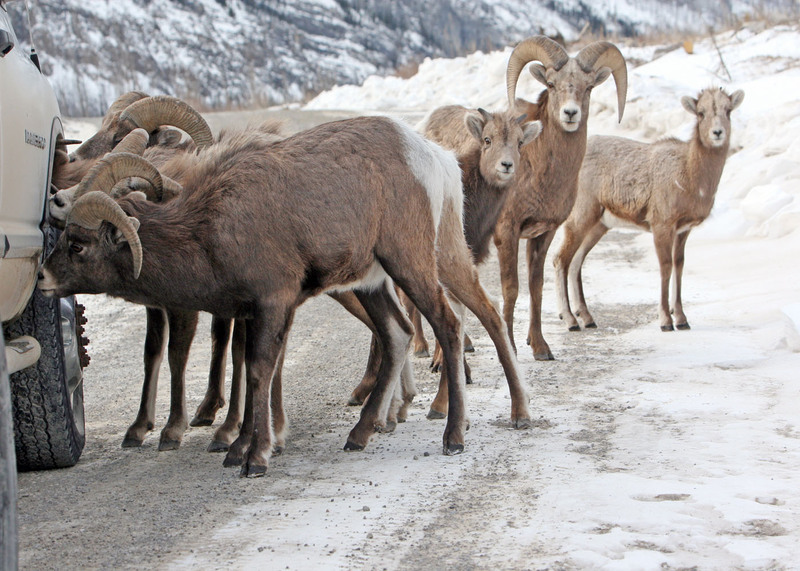 They then started to lick under the wheel wells for salt oblivious to the fact that we could reach down and touch them. After finishing the hold up on our vehicle, another vehicle came up behind us. So off the herd went and blocked the path of this next victim. They then started to lick at the salt off of it. Both of us and the people in the other vehicle were laughing in pure delight at this wonderful occurence. I have made a few more trips out to wild horse country. The snow is continuing to pile up and the roads are becoming a little more difficult to negotiate. 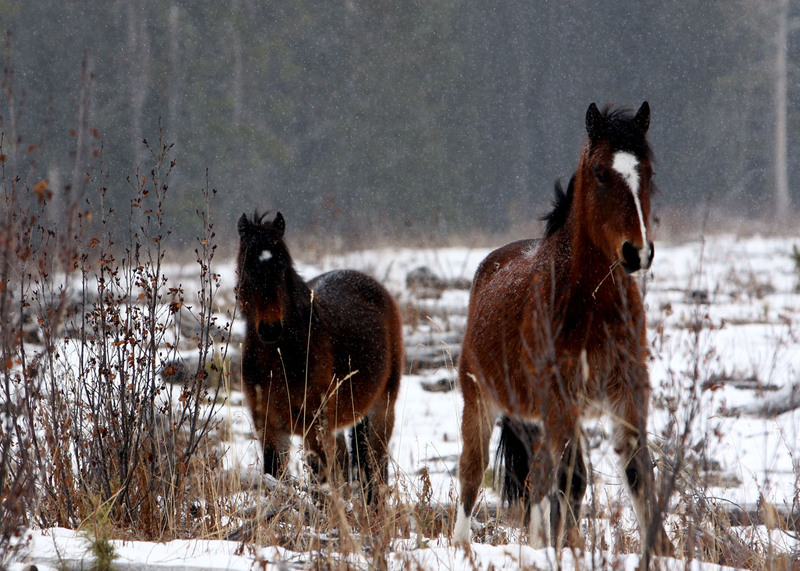 In all cases the wild horses are looking in great shape, despite the snow and the varying winter temperatures. There coats are thick and their body reserves are still good. In the last two trips out west, including this past Sunday, the westerly winds have been blowing exremely hard. The barren hilltops although being blown free of snow, are impossible to be on because of the force of the force of winds. In the bigger and more open meadows the snow piles even deeper as the wind howls through them, bringing in the snow from the surrounding trees. This has made the horses more difficult to find, as they do what I call “tree up”. Here they go into the heavy forest and await the winds to abate. There is still feed under the trees, but this is the danger zone. 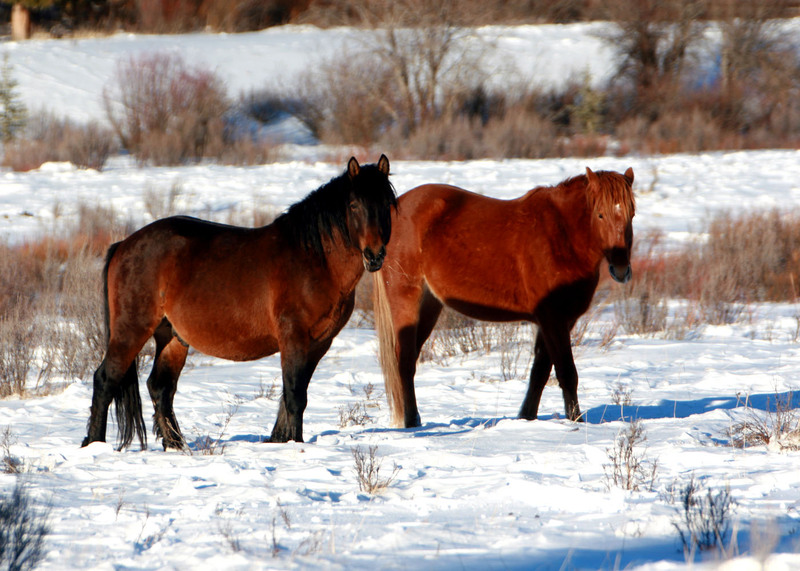 The wild horses rely heavily on their eyesight to spot possible predators and their ability to smell a predator is also greatly reduced because of the swirling wind wind currents. The wild horses are extremley alert for danger. They are however far more vunerable to attack from the wolves but especially the cougars who usually pounce on their prey from above. 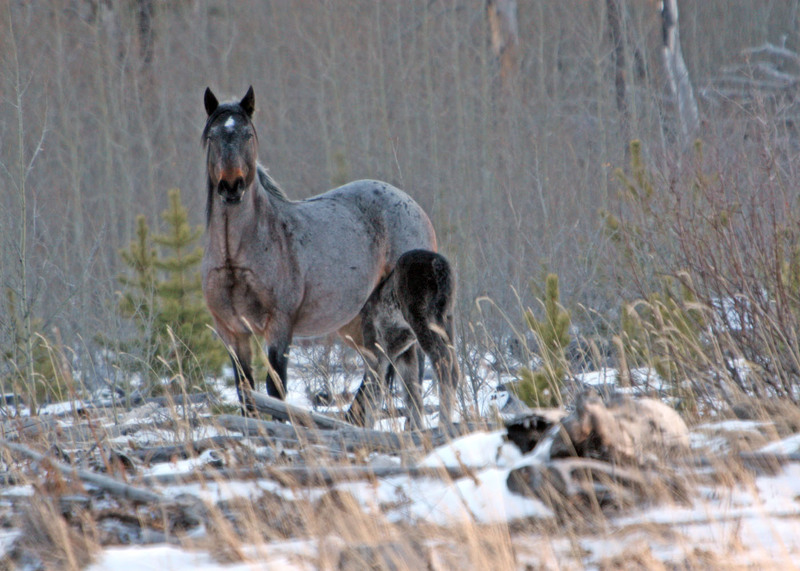 On another note, the Wild Horse trapping season comes to an end on February 28, 2011, but by that time it will be too late for many of the horses that have been capture. I urge all of you to continue to write to the Minister Mel Knight, to protest these capture seasons. The SRD continues to say that they have to do it for population control, but come with me and I can show you that the wild horse numbers a far from being to a point of being over populated on their range. The SRD continues to bow to the big money concerns who want to see your wild horses removed from their natural environment. On a more positive note, two major television companies are interested in doing good news type stories on our wild horses. One of them is a European network and the other is a Canadian one. I will keep you posted. Thank again, to all of you for your continued support. Bob.